Mots-clés: court terme, location de vacances, studio, meublé. We really liked this roomy and comfortable rental. It provides easy access to the College Ave., Piedmont Ave. and Broadway corridor as well as those communities. We were visiting family and this was a great get-away-near-by with space for having a few friends over for intimate conversation. Our only caveat is that the pavement outside - patio, gate, and even sidewalk are uneven so would caution older adults and young children to be very cautious. Thank you. Little studio was everything we needed, and we loved how there was tons of places within walking distance. We really enjoyed our stay, and would love to come back again. We enjoyed our stay in this quiet neighborhood during Christmas week. The kitchen was well set up and coffee and tea were on hand when we arrived. We appreciated the space heater, as morning and evenings could be chilly. It was especially useful for warming up the bathroom before showering. The bed was comfortable and everything was clean. We liked staying where so many things were in walking distance. We came from and returned to SFO using Bart/bus/Uber. We enjoyed our stay. The space was clean. Nice garden area. It is a great value for the neighborhood.Judy was very responsive and accommodating. We have enjoyed staying at this location twice now, and as long as our daughter lives in the area, we will continue to rent this location. It is conveniently located to Piedmont Avenue, a favorite of ours. We enjoy walking to get our groceries at Safeway, but the new Sprout's on Broadway is just a short drive away as well. The space is comfortable, clean, and warm (which is good on a rainy day.) Judy is extremely helpful if needed, we had issues with the microwave/convection oven because we had never used one and Judy was most helpful. We have some great memories staying at this location and have met some nice people staying upstairs. When your schedules don't sync, the noise from upstairs is noticeable, but not enough of a bother to keep us away. We did not use the patio/barbecue area this visit, but it makes for a great area to entertain. I would recommend this location for others if you want to explore Oakland. We were always able to find a parking space on the street and having laundry right on site is a huge plus! Thank you Judy for your hospitality! Thank you Sue! I am so glad you enjoy the studio. 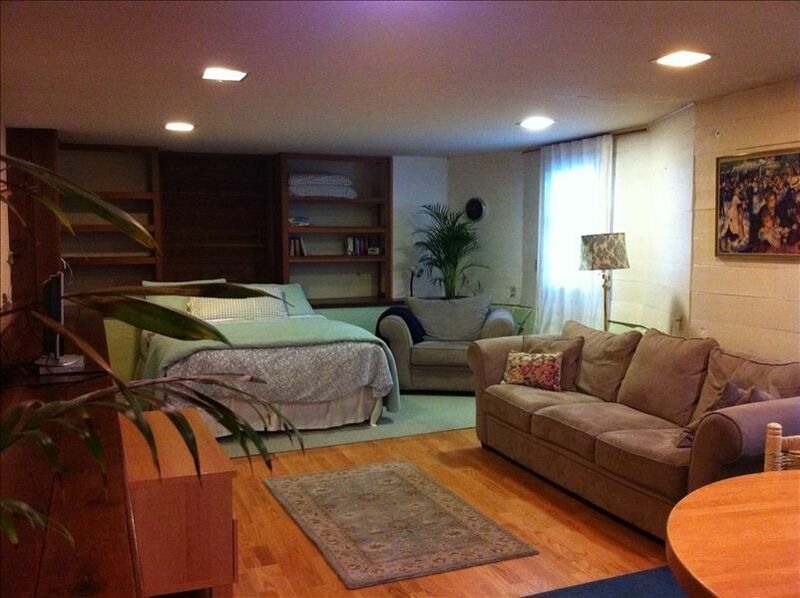 Very clean and comfortable, great location, walkable area. Loved the garden/patio area and barbecue. Would stay there again.